We’ve been fans of the crown braid for years because it’s just the right amount of classy, with a touch of royalty, without being over-the-top. 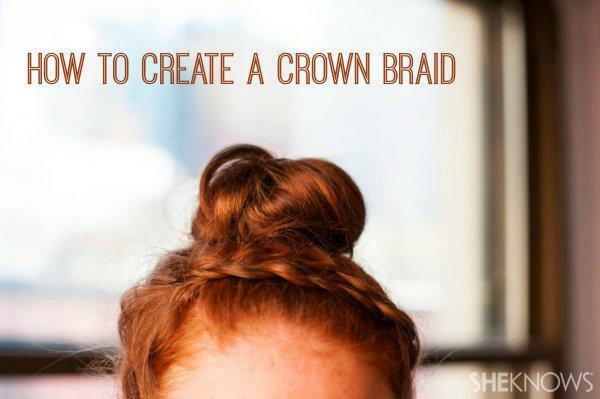 t Have you always wanted to attempt a crown braid, but didn’t know how or thought it looked too complicated? Switch up your 2013 ‘do for one that’ll keep you looking chic in the New Year. t In this hair tutorial, we’ll give you easy step-by-step tips for getting the style at home — absolutely no professional stylist needed. Sounds like a win-win to us! t The braid only takes 4 simple steps. t For this look you will need: a tail comb and redhead hair ties (if you have blonde or brunette hair, a regular hair tie will work just fine). Create a diagonal section on the top of the head where the braid will begin. Pick up a small triangle of hair at the base of that section and break it down into 3 equal sections. Braid 3 strands underneath one another. Next, take a small section of hair from the top of the head and marry it into the left side of the braid. Leave the right side (or the part closest to the forehead) as it is, then continue to braid 3 strands underneath another. Continue these steps until you reach your desired stopping point, or travel all around the head for a beautiful updo. Watch this video for a more detailed tutorial. t Rock it like a redhead!